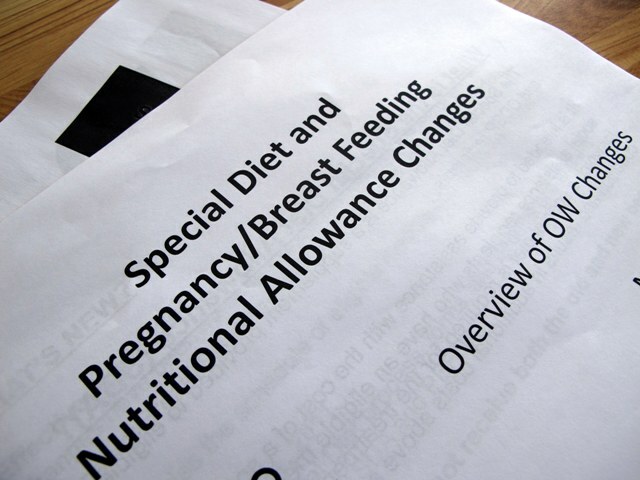 Effective April 1st, 2011, changes have been made to the Special Diet Allowance (SDA) and Pregnancy / Breast feeding Nutritional Allowance (PBFNA) schedules for the Ontario Works recipients. This includes the schedule of eligible medical conditions and rates. Effective July 31st, 2011, the current Special Diet process, forms and benefits end and are replaced by the new SDA and PBFNA, this meaning that a recipient can not receive both the old and the new benefit at the same time. Current Special Diet (SD) recipients can now apply under the schedule any time; in order to avoid disruption to their payment, a current SDA recipient must submit a new completed application form to their caseworker by July 2011. – the eligibility criteria for some conditions change and some will be removed from the schedule including egg allergy, soy allergy and chronic constipation. The maximum allowance per person remains capped at $250 per person per month. Current recipients should be booking appointments with their health care professionals to have the new form competed as soon as possible. The Pregnancy / Breast feeding Nutritional Allowance form which is currently ‘combined with the SDA application form , effective immediately, it will have a standalone form. The form completion fee is $20, physicians completing the SDA and / or PBFNA application form can continue to bill through OHIP, other approved health care professionals can submit an invoice for payment to the local OW or ODSP office. Information on the new changes is also available on the ministry’s website here.